I believe I may have the largest template collection known to man - I’d like to meet someone who has a bigger one so we can combine forces. Anyway, let me know if you’re looking for something in particular and I will see if I have it. My website has a bunch available for download, but I have tons more just waiting to be checked, sorted, and uploaded. Just let me know the model and I’ll post it up for you if I have it. 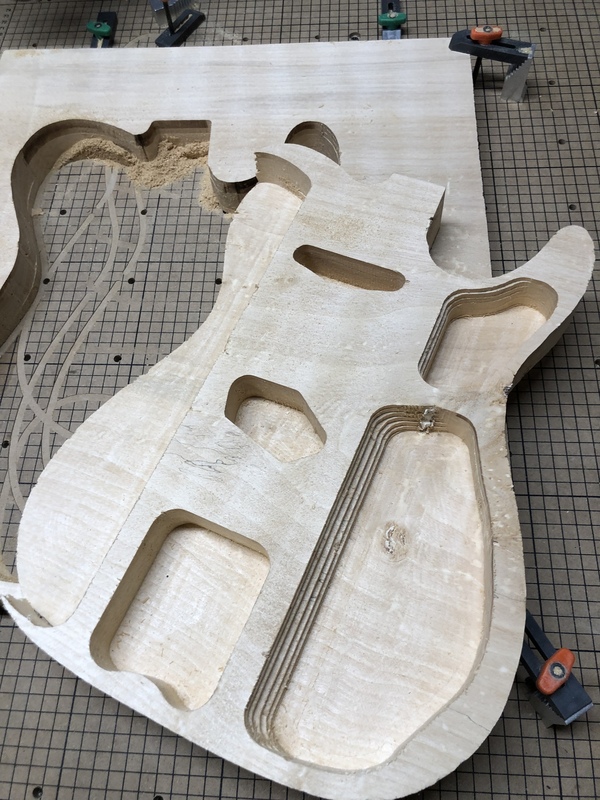 Could someone help me, please find a telecaster body file? Been crazy busy. Sorry.want files or easel project links? Great job! What did you use for the black tubing around your truss rod access hole? and where did you get it? I’m not sure this German site has been mentioned, as I just skimmed over the entire thread. It has a ton of good drawings that people may be interested in. Some are PDFs some Are DXFs. 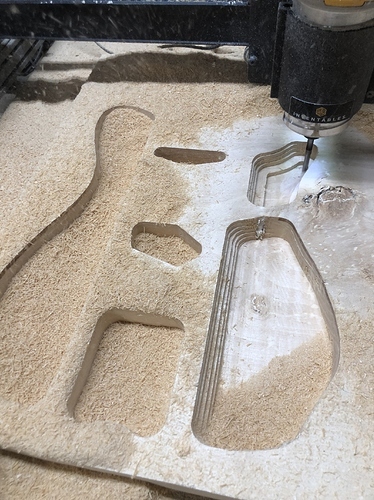 You have to be able to manipulate the drawings and convert them in other programs if you want to use them for your CNC router. It’s a rosewood plug, that has the truss access hole drilled out of it. I make them when I make my necks. Well, on a body with a laminated top, I actually put the body blank on the machine first, before I glue the top on, and have it engraved a little hash mark at the center, top and bottom (y axis) of the wood. Then I use those lines to line up the top when I glue it on. Since my blank rests in the exact same spot, I don’t have to find a new work zero before I cut the body. Ok thanks for the info. I’m going to start with roughing out necks. Just do some 2D carving of outline, truss rod channel, tuner holes and the headstock setback - doing a tele style neck. One other question when you jog the machine over so the bit is centered on the centerline of the body and keeping track of how far over you’ve moved, do you use a V shaped bit or a small bit so it’s easier to make sure it’s perfectly centered? Seems like it would be harder to do with a wide end mill to make certain it’s centered. Yes to both. The Mdf is a good way, as long as the thickness of it and the body wood doesn’t run out of height clearance. And yes, I use a little 60° end mill. I would love to get a copy of that file. Nice work! Just wondering if you ever had this problem while carving out a body. It seems likes it’s shifted my wood never moved either. ? Looks like everything started fine, then went off the reservation. Any tech guys wanna chime in here?